Sends Cheer from Maine to U.S. Troops in Afghanistan!! Last month physicsworld.com reported that physicists from CERN's ALPHA experiment had trapped 309 atoms of antihydrogen for 1000 s – smashing their previous record of 38 atoms trapped for one-fifth of a second. Now we can reveal that the team's success has brought it extra funding that, in part, will allow two new antimatter experiments to be built, as well as a new source of antiprotons. The study of antimatter such as antihydrogen is important in developing our understanding of the universe and in finding out why it contains so much more matter than antimatter. Speaking to physicsworld.com, ALPHA spokesperson Jeffrey Hangst explains that the team's next task is to study the structure of antihydrogen – an antiproton bound to an antielectron – using microwaves. "We will use the microwave frequency to flip the spin of the antimatter atoms. Then we may be able to detect the resonant interaction and look at their structure. This would be a modest first step towards actually understanding antimatter," says Hangst. Differences between the structures of hydrogen and antihydrogen are not predicted by the Standard Model of particles physics and could point towards new physics. Hangst told physicsworld.com that the ALPHA team is in the process of building a new detector called ALPHA 2 that will be capable of spectral analysis. 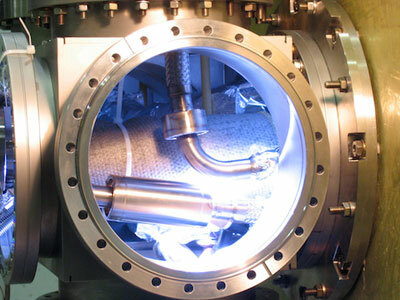 Unlike the current experiment, ALPHA 2 will include the lasers necessary to study the spectra of the anti-atoms. "We knowingly did not add lasers to the current ALPHA design as initially we wanted to just be able to create and hold the antimatter," explains Hangst. The team wants the new device to be up and running by 2012, so that the researchers can gather data before CERN's Large Hadron Collider shuts down for an upgrade in 2013 – which will also affect ALPHA 2. ALPHA's recent success has also encouraged CERN to go ahead with a new antiproton source called Extra Low Energy Antiprotons or ELENA. ELENA was proposed several years ago but stalled because of a lack of funding. But now, jubilant CERN boss Rolf-Dieter Heuer told physicsworld.com that he has given the go-ahead for the ELENA source. The current source decelerates antiprotons to 5 MeV before supplying them to ALPHA and other experiments at CERN. ELENA will deliver antiprotons at about 100 keV, which will provide ALPHA with a larger number of usable antiprotons and will also increase efficiency. With the new ELENA source in place, Hangst hopes that a further update could be made to the ALPHA experiment, dubbed ALPHA 3. This next-generation experiment would allow the team to further cool trapped samples of antiprotons and allow the researchers to study gravitational effects on antimatter. "Laser cooling for hydrogen is difficult but it can be done," says Hangst, who believes that all these updates could occur during the next 10 years. "Just in time for me to retire!" All in all, exciting times lie ahead for antimatter research in the coming years. "All the current news is good and encouraging. We know that our approach is the right one," says Hangst. Take a look at the video below – it is an interview conducted by Channel 4 News in the UK with CERN director-general Rolf-Dieter Heuer, where he talks about ALPHA's recent advances. Listen out for a mention of Physics World towards the end, when Heuer recalls that we made ALPHA's previous antimatter study our Breakthrough of the Year for 2010.
to the best of my knowledge all the experiment at CERN are performed with no background (vacuum) but in actual universe evolution we have very high energy density at the time of matter and antimatter creation also the structure of space may not be same as today. I mean to say is it reasonable to compare the actual evolution conditions with the experimental setup. Really exist antimatter periodic table?? I think that it would be very interesting to know if it is symetric to matter periodic table??? TVT Yes it is symetric as it has a twin. I think they should enjoy 'it' while it lasts. The truth is that there is nothing new here. Physics needs a major over haul and i'd be very (pleasantly?) surprised if it comes from CERN. The amount of anti-matter is small, and to contain it with ordinary matter is impossible. Magnetic field is considered as one of the option.